On the hottest week of the year – get back in the bakery! Regular readers will remember the fantastic week that my baking buddy, Katie, and I had at The Bertinet Kitchen Cookery School back in January. As a lover of almost all French food*, especially that found in the Boulangerie & Patisserie, we decided to go back to Bath last month for a Masterclass in Croissant and Viennoiserie. I was looking forward to discovering the secrets of laminated dough, rolling croissants and slicing Pain au Raisin. I had tried to make these Parisian treats a few times before, but unfortunately without much success; they either didn’t rise and were like biscuits, or discharged their butter whilst baking giving a ‘fried’ consistency or simply burnt as I persisted in attempt at a crispy finish. 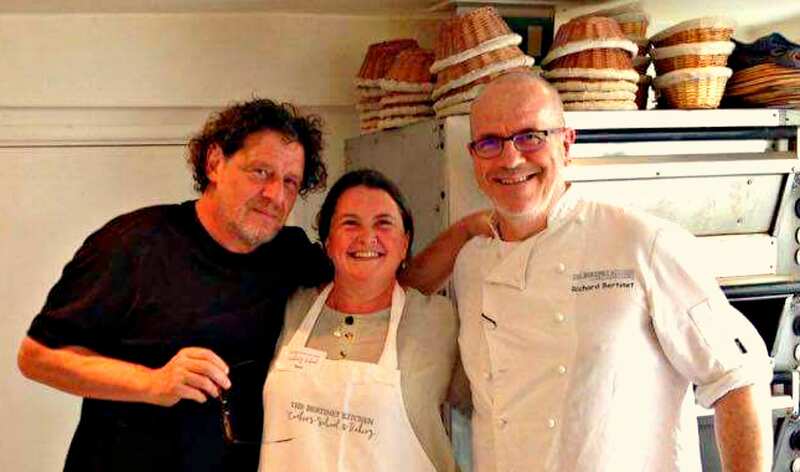 I needed to learn from the French master baker and trusted Richard Berntinet’s experience and teaching skills to help me achieve my mission, it was simply a bonus that Marco Pierre White popped in to say hello at lunch time! Richard explained the origin by telling the tale of the 17th century bakers working the through night in Vienna that was, at the time, under siege by the Turks. In the still of the night, they heard an underground rumbling which turned out to be enemy tunnelling under the city walls. As it was the brave bakers who sounded the alert, thus saving the city, they were commissioned with leading the celebration of victory and chose to bake pastries in the shape of the crescents on the Turkish flag that could be munched in memory of their enemies defeat. There are several stories that explain the introduction of Viennese pastries into French culture, one of which (my favourite) is through the marriage of Austrian born Marie Antoinette who became the last queen of France before the revolution. I’ve been practising regularly since we finished the course, what do you think? So what about Danish pastries? Well, we’ve already discovered the Austrian origins of the croissant, so how did their cousins, often adorned with custard, fruit, nuts and extra sugar (and still associated with France) get named after a completely different country all the way up in Scandinavia? Apparently, it was the super star bakers, particularly those from Vienna, who saved the day *again* this time for the nation of Denmark when they called in for extra help in the 1850’s as the local bakers had gone on a long term wage strike. Bringing their favourite recipes from the homeland, the new treats took the country by storm and demand persisted long after the strike had ended and the Viennese heroes had returned back to their families in Austria. We have had fantastic weather so far this year, the grapes are growing, the squashes are swelling and the peaches are performing very well under the poly arch that we built to protect them from peach leaf curl. Whilst it’s warm, and dry, we love to make the most of being outside and the long summer days can allow us great opportunities to try something new during evenings in the garden. As subscribers know, we are great fans of Cultivate London and were delighted to accept the invitation to run a bread making class in the beautiful Salopian Garden down the road in Isleworth. With most of my bread baked in the electric oven at home, I relied on my Easter experience of baking hot cross buns in the cob oven and the invaluable support of Farmer/Chef Matt Watts who was the master of the wood oven for the evening. I devised a special course that taught a variety of bread making skills and brought different flours and goodies to incorporate into the doughs. Over three hours in the evening sun we made organic white stone baked loaves, dark seeded rye bread and maple & pecan wholemeal soda bread. Whilst the loaves baked and the foxes peered over the fence to question why the garden wasn’t free for them to roam through, we sipped lavender cordial and nibbled on flat breads accompanied by dips made with fresh garden produce. Sometimes you just need to seize opportunities as they arise to remember the simple pleasures, don’t you? It’s been great to work with some local schools recently, Sarum Hall in Hampstead asked us to support their Great Fire of London lessons by teaching some of the recipes that would have been baked the night the bakery in Pudding Lane caught fire. We have been honoured to have been asked to run some staff training days for our friends at Omlet, as a customer for over ten years, and running courses for seven years, the directors thought that it would be great for their team to visit the chickens & bees at Hen Corner and see how great their product work in a London garden. *It’s snails that I’m not really a fan of, however, I love the regional dishes of France that celebrate the bounty of the seasonal harvest and of course the wonderful range of cheese and wine. Do you have a favourite dish that reminds you of your holidays? Our next Baking Together (family course) is on Wednesday 25th October in Half Term.